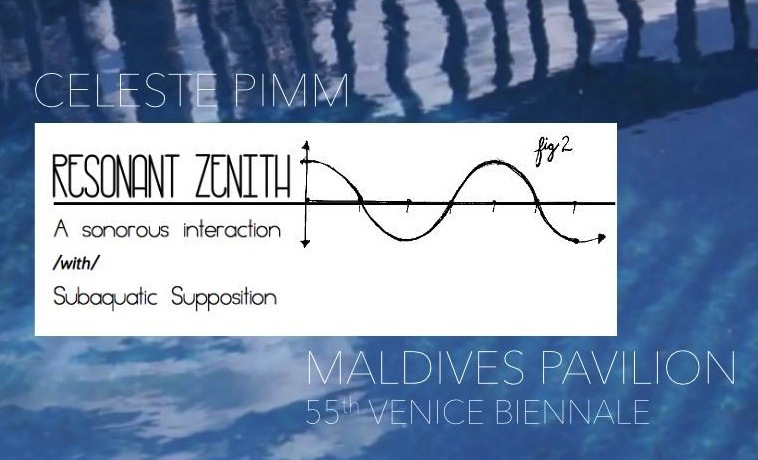 Celeste Pimm in conversation with Dorian Batycka on her project Resonant Zenith, part of Maldives Pavilion Events, 55th International Venice Biennale. Dorian Batycka: Lets begin from the beginning, what is Resonant Zenith? Celeste Pimm: Resonant Zenith is a sonic and sculptural interplay of burgeoning environmental crisis, presented for twin sinking lands. The solemnity of rising water levels due to climate change is easily overlooked by casual viewers on a beach. The inconspicuous visual development of the phenomenon is hardly a cause for alarm, as it is essentially unnoticeable when observing these bodies of water for short periods of time. However, for Venice and the Maldives, the destructive potential of rising water presents a stark reality of a submerged future. Resonant Zenith, an eco-aesthetic and sculptural installation, provides a method of transforming live perception of water/shore interactions into a multi-faceted, reactive coaction. The dynamic physical elements of the installation’s environment, namely water washing onto beach shores, are mechanically transformed into a warning system for a consequential future. DB: You mention the destructive potential of rising water patterns and the urgent need to develop a warning system. In some jurisdictions – predictably in Maldives and Venice – coastal protection and management is a very important issue. The engineering methods range from seawalls, floodgates, early warning systems, remote sensing using data, etc. These initiatives often relate to the notion of the horizon, which has situated concepts of subject and object, of time and space, throughout modernity. Though as our spatial and temporal orientation has shifted over the last century, given advancements in science and engineering that have spawned technologies such as google maps and satellite views, everything that lies beyond the horizon remains the same: muteness and silence. I’m wondering, how do you conceive of the horizon in relation to Resonant Zenith? What are the conceptual horizons in which it is based? Are we all – like the Maldives and Venice – doomed by being consumed within the horizon of our very existence? CP: Topographical perception of oceans and bodies of water are significant within Resonant Zenith relating to the limits of the human visual system. A horizon is an apparent point of disappearance- a point of mental conviction, and yet a point of factual fallacy. Three-dimensional horizons exist around points of reference. The flexibility in the visual nature of an ocean can form misconceptions. For example, the inherent belief that oceans are invulnerable can aid to explain the disconnect with respect to personal responsibility and environmental destruction. Cognitive dissonance is experienced when facing a long-term and slowly emerging problem. The visual nature of a horizon- a place of false disappearance can parallel the shortcomings of human nature when considering our capacity to plan for the future. Mankind is doomed to be consumed by the causatum: by our inability to process factual data into action, where we instead focus on instinctual points of appearance. The horizon changes as you revolve around it. DB: Most your work tends to oscillate around ideas of sense perception and how art can function in relation to the sentient experience, though Resonant Zenith seems to me as somewhat a point of departure, instead attempting to conceive of life as a universal contingency, not bound to any singular notions of individuality. What’s most interesting for me about Resonant Zenith is how it seems to function in this way, as a series of bells chiming with the rising and falling of the tide, installed throughout various points within Venice, almost as if saying: ‘yes, global warming is happening and ocean levels are indeed rising, but there is no nature outside of Nature, meaning humanity is qua Nature.’ I’m wondering, in light of all this, how do you conceive of nature? And how does this definition function in relation to Resonant Zenith? CP: The dualistic human relationship with nature is hard to rationalize. The general notion that mankind is harming nature is amiss. In actuality, the hindrance degrades the longevity of our species, as we are tentatively linked to the earth. Resonant Zenith exists as an interaction with the dynamism of natural systems- as a human product that coacts with disorder without the necessity of sentient interpretation. Earth will regenerate. If there is no sentience, this transformation will not be agonized over. A single toll of a bell could measure three seconds of one human life. A single toll could measure the blip of time that is human sentience. Resonant Zenith is a human product that does not require definition as it will continue to interact with it’s environment never the less. DB: So as a sort of dialog exploring sentience and environmental degradation? DB: Art and science are often linked metaphorically, with many artists culling inspiration from scientists and vice versa. Your work often seems to tred this line as well, existing as a sort of dialectic between science (logos) and art (poiesis). How do you conceive of art and science? Are they one and the same? Or entirely different? CP: For myself, art and science are my two main mediums of understanding. Where science aims to understand how to describe and manipulate hard data, art aims to understand contextual and situational information. These methods of observation serve as ways to explore the depth of a concept from contrasting perspectives. When used together, artistic and scientific analysis help form an individual-specific idea of how an article behaves and functions. Because I can only experience using my own mind, my perceptions are formed by my personal creative biases, as well as by hard data. This union creates my specific truth. DB: Bells have a unique history, both in the East in Ancient Chinese culture, later in the West where they became imbued with religious connotations, also relating to the passage of time. I’m wondering if you could comment a little on why you chose to use bells for Resonant Zenith, and how you feel about their usage in more of a historical and political context? CP: I chose to use bells as my dynamic sonic mechanism within Resonant Zenith because of the perfect simplicity of their design, and the clarity of tone produced by a bell. Historically, bells have been used as markers of passing time. Additionally, they have also been used as warning signals, and musical instruments- two purposes that the bells in Resonant Zenith serve. Acoustically, the strike tone of a bell when first hit is the notable sound identity of a bell. Still, there are more subtle overtones that ring and resonate before fading. The simple action of striking a bell has abrupt and jarring effects as well as more subtle and long-term effects, which is reflective of the nature of environmental degradation that is being addressed within Resonant Zenith. Celeste Pimm is an artist and musician currently living in Canada.